Outstanding Achievement Award for the UNAA Young Professionals! Congratulations to Ingrid Valladares – graduate of the Masters in International Relations degree - winner of the inaugural Outstanding Achievement Award for the UNAA Young Professionals! Ingrid has been a board member of the Young Professionals’ Queensland team since 2016. As a Social Media and Public Relations Manager, she has been pivotal in the development of the group's online presence and has played a crucial role in the success of the QLD team to date. Ingrid's achievements include the creation and day to day management of the team’s Facebook page, which has attracted over five-hundred organic likes and reaches around a hundred users daily. On the job, Ingrid has had to teach herself skills in IT and web design, thus increasing her skill set and growing her personal development. Ingrid oversaw the launch of the first ever UNAA Young Professionals blog, editing international affairs articles and event summaries. 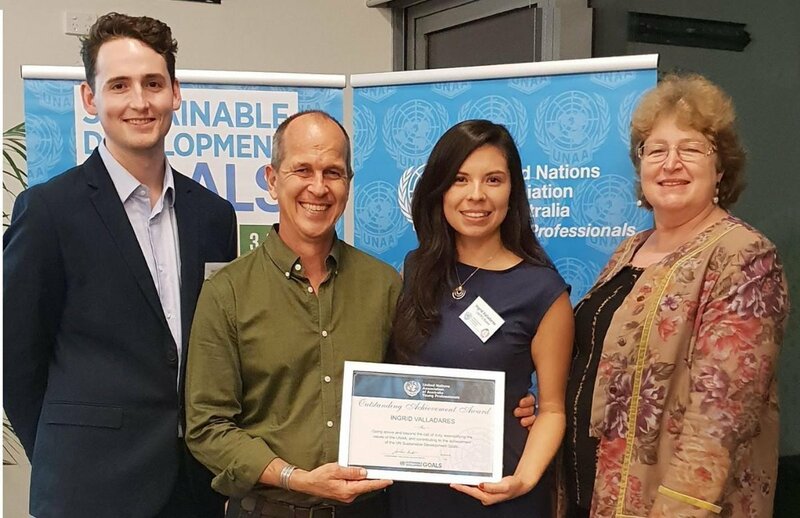 Ingrid continues to be the organisation's link to members and the wider community, and her commitment to both the team and the values and work of the UN make her the perfect recipient of the inaugural volunteer excellence award.